Well-known botanist T. Ananda Rao has collaborated with ornithologist and photographer S. Sridhar, to bring out “Wild Orchids in Karnataka- A Pictorial Compendium”, which is at once a run through the captivating world of orchids and a journey in the ecological hotspots of Karnataka. The original “Orchid Man”, Dr. Ananda Rao, has dedicated the book to Hanumanthu, a monkey that helped him collect orchids from tall trees in the Western Ghats, in the “orchid guilds”, or the special ecological niches where orchids can be found in the Talacauvery range, the Bababudangiri-Kudremukh National Park area, and in the Dandeli-Sirsi-Yellapur area. How did the botanist train the monkey to grab all those orchids? Well, it took six months. Much harder than teaching a monkey to do dishes. Sadly, as the previous link mentions, Hanumanthu was beaten to death by a policeman when the monkey was being used by a street performer. Rao tried to train a replacement, but "it is not obedient. It eats up the entire banana and refuses to do the work. However my field work has come to end point there is no necessary to train a monkey or its young one which is not obedient to do its work. For some period I had hired two tribal men for my fieldwork, but nobody is as good as Hanuman." About the modifier for Hanuman - its common in many parts of South India to modify a noun to evoke a feeling of the local language. Example: Srinivas is a common name around South India. 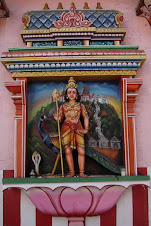 It can be modified to Srinivasulu (Telugu), Srinivasan (Tamil), Srinivasa (Kannada). Have fun in your wanderings. I must go now and wander someplace else :) I liked your blog.